Over 100 women and men from NCCP member churches and ecumenical partners gathered at the Ecumenical #OneBillionRising to hear testimonies from women affected by drug related killings, write letters to political prisoners, express solidarity for the resumption of the GPH-NDFP peace talks, and dance against gender based violence at the Church of the Risen Lord, University of the Philippines, Diliman, Quezon City last Feb. 11, 2017. Themed “Our Love Compels Us To Celebrate the Spirit of Resistance, Redemption and Liberation,” this event was a response to this year’s global One Billion Rising campaign that aims to give a sharper focus and visibility to the exploitation of women, and to harness even stronger global solidarity to demand an end to violence in all forms. In a Biblico-Theological Reflection, Rev. Irma Balaba, NCCP Assistant Program Secretary on Christian Unity and Ecumenical Relations cited the situation of drug related killings in the country. A mother whose son was a victim of a drug related extrajudicial killing shared her ongoing efforts to seek for justice with the religious network, Rise Up for Life and Rights. “ Sa ating mga taong simbahan na nagpapahalaga sa buhay ng tao, ma-bata man o matanda dahil tayo ay naniniwala na ang ang lahat ay nilikha kawangis ng Dios, patuloy nating isinusulong at pinuprotektahan ang karapatan ng bawat tao,” Rev. Balaba said. “Marami ng mga ina at mga anak na nawalan ng kanilang mga mahal sa buhay. Patuloy na tumatangis, nagluluksa at sumisigaw ng katarungan na hindi naman nagawaran ng kasalukuyang pamahalaan,” Rev. Balaba added. Rev. Balaba shared her insight on the status of the GPH-NDFP peace talks and called for support in the call #PeaceTalksItuloy. “Ang pag-atras ng Pangulo sa usapang pangkapayapaan ay nakakalungkot na hakbang mula sa isang namumuno na inaasahan ng mamamayan na mangunguna sa pagsulong para sa tunay at makatarungang kapayapaan Ang pag-uusap sa pangalawang substantive agenda- ang socio-economic reforms ay batayang tutugon sa mahigit limang dekada na na armadong labanan ng armadong sandataan ng Pilipinas at ng New People’s Army,” Rev. Balaba said. 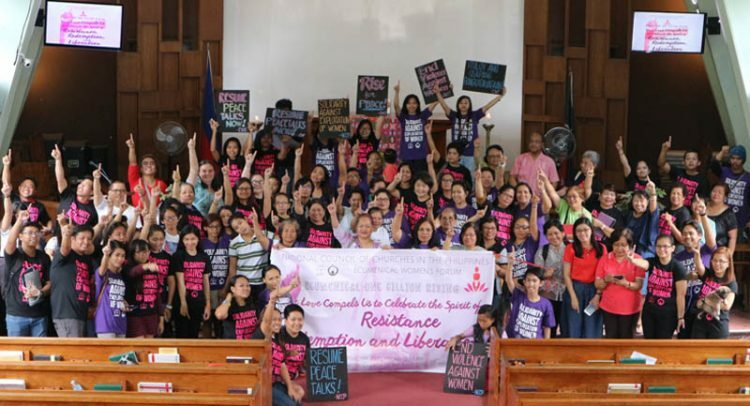 Members of the Ecumenical Women’s Forum (EWF) read their statement that affirmed their hope that just and lasting peace is possible regardless of the challenges to its fulfillment. “We, the women of faith, believers of Justice and Peace, will always support the Peace Talks between the Government of the Republic of the Philippines and the National Democratic Front for the welfare and greater good of every Filipino, specially the young and the future generation,” said EWF in their statement. EWF believes in the validity of the agenda of peace talks in addressing the roots of the armed conflict. “We trust in the agenda of respect for human rights and international humanitarian laws, social and-economic reforms, patriotic and people-oriented constitutional reforms, and the cessation of hostilities,” EWF said.